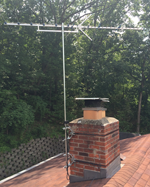 Mr Antenna in Cincinnati and Dayton, Ohio has been professionally installing TV antennas on homes since February 2013. 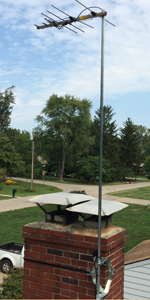 It puts the antenna up high (higher is almost always better than lower for reception). It doesn’t require any holes in the roof or house. 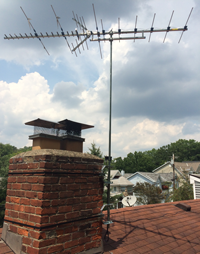 Mounting antennas on the chimney with a traditional mount takes significantly longer than non-chimney mounts. Chimney mounts take so much longer that most installers won’t even use them. This lead us to find a better solution. Blake UK recognized and addressed this problem in 2003 by introducing the Stack Strap Chimney Mount. 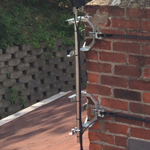 It’s significantly faster and easier to install than traditional chimney mounts. It’s so popular in the United Kingdom than they’ve sold over 200,000 units but the product wasn’t available in the United States. 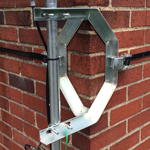 Through a series of conversations, Antenna77, LLC doing business as Stack Strap Chimney Mounts was created to be the North American distributor of the Stack Strap product. We’re a small business between Cincinnati and Dayton, Ohio. John manages and participates in antenna installations and provides telephone support for the Stack Strap Chimney Mounts. 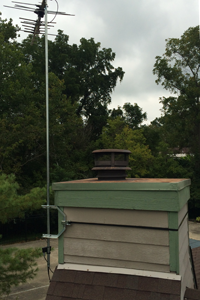 Our goal is to make you a satisfied client by making your antenna installation easier. We look forward to helping any way we can.